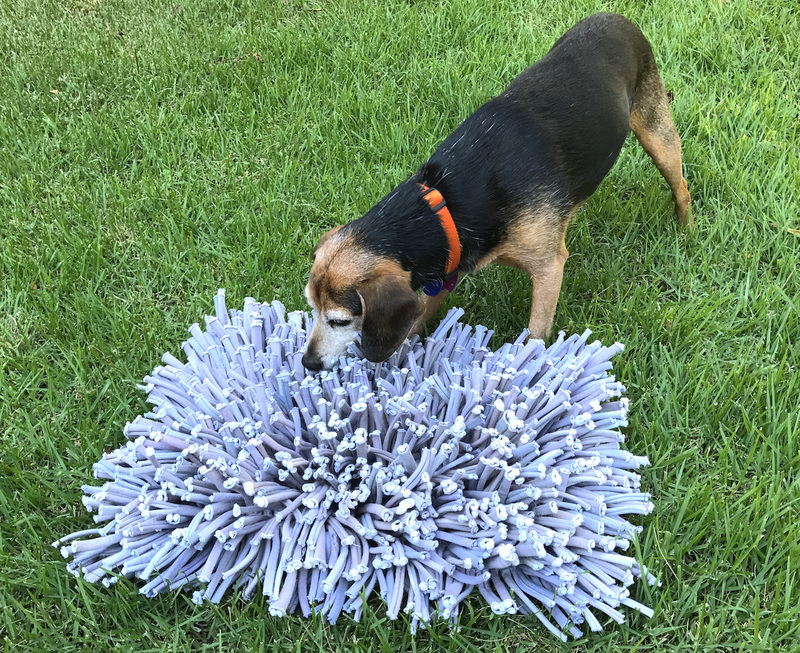 Snuffle mats are one of the easiest food toys for dogs to learn how to interact with. And if my dogs are typical, snuffle mats are among the most fun ways to eat as well. A snuffle mat is a mat with multiple fabric strips protruding from a base. Homemade ones are usually created by weaving fabric strips through a grid—usually a rubber mat with a pattern of holes. Some pre-made ones are stitched together on a fabric base instead of the rubber mat. The fabric strips are placed as densely as possible to make lots of places for kibble or other dry food to hide. The dog manipulates the fabric strips with her nose and paws as she sniffs out the food. Snuffle mats and other food toys are great ways to provide your dog with enrichment. 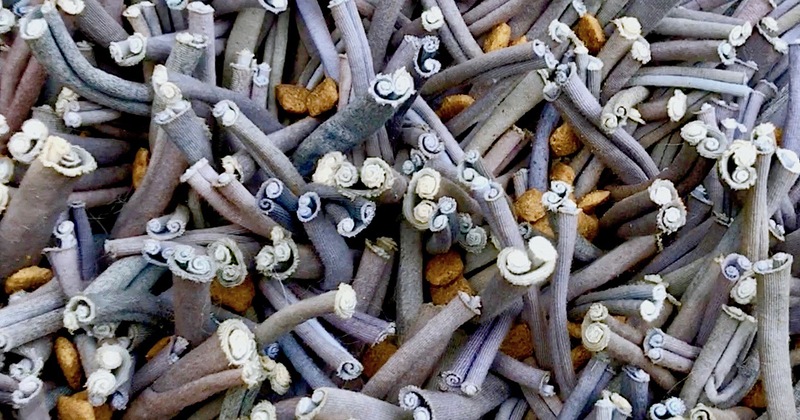 Enrichment, especially lifelong enrichment, has shown to reduce the incidence and severity of canine cognitive dysfunction. So even if you came to this site because of your older dog, be thinking about your younger or future dogs as well. In my book, I have a whole section about enrichment for dogs with dementia (and all senior dogs). 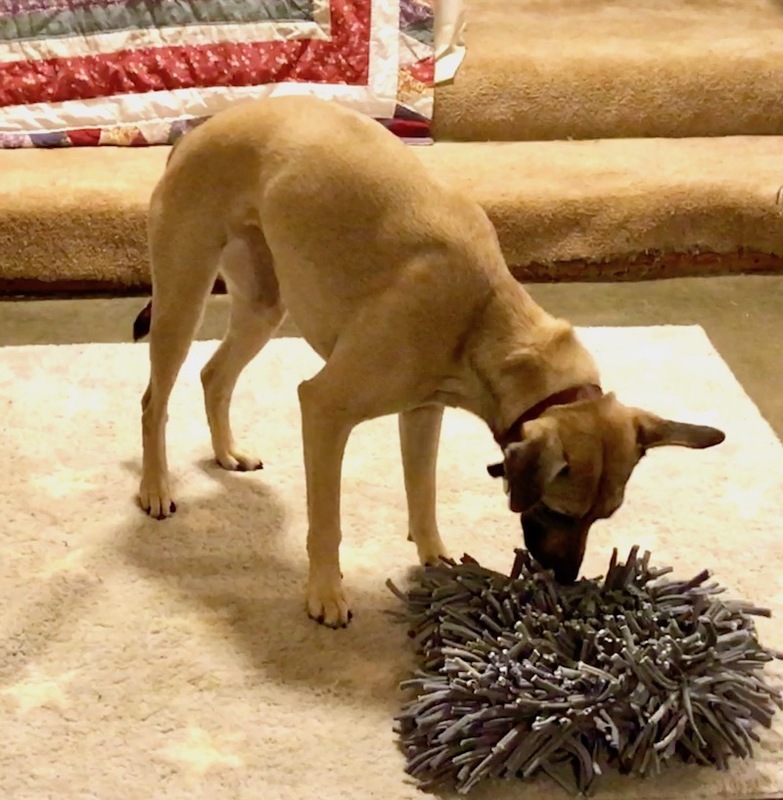 Here is my senior dog Summer getting excited about her snuffle mat and then going for it. You can even hear her snuffling! • Introduce your dog to a snuffle mat only if she has a good appetite. They are not appropriate if your dog is picky or frail. They do make eating a bit more of a challenge. Most dogs with a hearty appetite will find it a fun challenge. • Be careful with puppies. Snuffle mats are not appropriate for puppies in the “chew everything” phase or for any dogs who want to chew up fabric. • Supervise any dog with a snuffle mat. Pick it up as soon as the dog is finished so she won’t be tempted to go for the fabric. I was afraid my dogs would want to eat the fabric, but I never let them get in the habit and now they leave the mat alone when they are finished with their meal. But I still pick it up, because they are dogs and there’s always a first time! • Wash it regularly. Most dog food has a moderate amount of fat in it, so the mat will eventually get greasy. (Not to mention slobbery!) My snuffle mat is washer and dryer safe. It does take a long time to dry. • Be sure to use fabric that is “food safe” if you make your own. No toxic dyes, etc. This is why I bought one readymade from a reputable source. • Consider your dog’s normal eating habits. Snuffle mats, like most food toys, may not be interesting to dogs who are free fed. The point of food toys is to challenge your dog to use his body and brain to get his meal. If he has food accessible all day in a bowl, he may not be interested. Follow your vet’s advice on this of course, but most trainers recommend feeding your dog in meals, rather than having access to food all the time. It opens up a world of training games and enrichment with food. It also allows you to notice much more quickly if your dog isn’t eating normally. Here’s a source for making your own: Snuffle Mat Mayhem. You can also check Pinterest. I bought my mat from Your Mannerly Mutt. I love it! There are lots of handmade ones on Etsy as well. If anybody has a photo of their senior dog enjoying a snuffle mat that they would to share, drop me a line through the photo gallery page. In the meantime, happy snuffling! Thank you to Tina Flores of Doggie Einsteins Training for her photo of adorable Chile the dachshund enjoying her snuffle mat! Dachshund photo copyright 2017 Tina Flores. How big is the snuffle mat that you ordered? I’m sorry for my delayed response. The information doesn’t appear to be online (as you probably already found out) and every time I read your comment I was away from home. I measured it. The base is 11″ x 17″. Hope this helps.